Enjoy a Cookie! Keep Warehouse 13 ALIVE!!!! As many of you may have heard, we are losing the “World of Endless Wonder” that has become a Science Fiction staple today, Warehouse 13. This has stirred me to action. I have seen too many show with great casts and characters thrown into the night because “there aren’t enough viewers”. So freaking what?! When this show first aired it broke all the records for cable TV viewing audience. It’s pilot episode was watched my 7 MILLION PEOPLE! You can’t tell me those people have gone away. I know what has happened. In this day of Digital Freedom, the fans still watch – we just aren’t being counted by the “Nielson” system because we buy the show on iTunes the day after! I, myself, am guilty of this – because I haven’t had cable TV in 2 years! Why pay for what I’m not using? I buy just what I want, in season passes, and get what I pay for. Now I know this cuts out some advertising revenue – but advertisers don’t tell us what to put in our shows – they use it as a platform. Trust me – they’re still getting enough money from the freaking web ads we have to deal with non stop! So, I have decided I have had enough. I am not going to let my TV show slip silently into that dark night. I helped save a little show over on the CW network called “Supernatural” 6 YEARS AGO – you may have heard of it. It’s going strong into season 9, and now is in syndication on TNT, getting a whole new bevy of followers. Warehouse 13 is patriotic, from it’s core. It is an American show. I travel the world and have friends in many countries, but I am starting my campaign like a few men did back 1776 – when they fought to keep something they loved, founded in the belief that all men have the right to the pursuit of happiness. Well, folks, Warehouse 13 MAKES ME HAPPY. And I don’t want to see it go! So I’m calling in all my brothers and sisters in arms, not just American; this is a new generation – a digital generation. We are Citizens of the Net – “Netizens”, and I say we have a voice! Here is what I encourage everyone who reads this to do. Now, I have already done this. In the next few photos, I am going to show you exactly how easy this is. I hope that you will spare $5.44 to help get this message out – because the freedom to enjoy what we love is priceless. Please, make a statement with me? 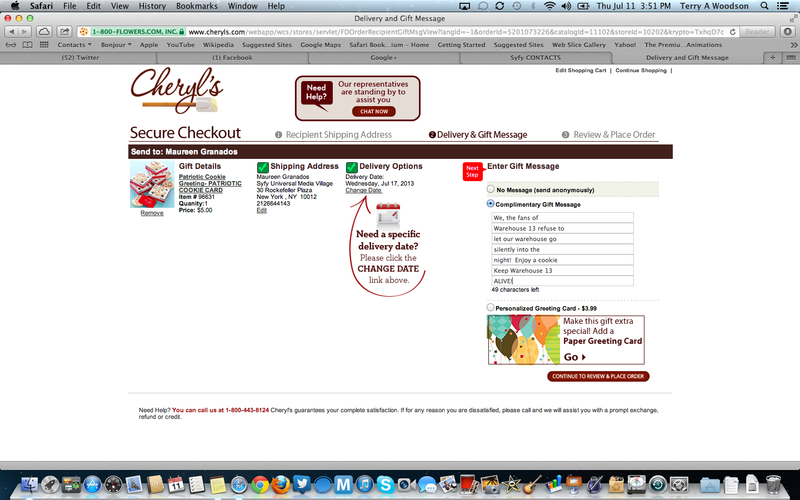 Once you enter this information and continue, you will get the message that the exact address doesn’t match. That’s OK – we don’t have to give the exact suite number – the building receptionist will no where to direct it. 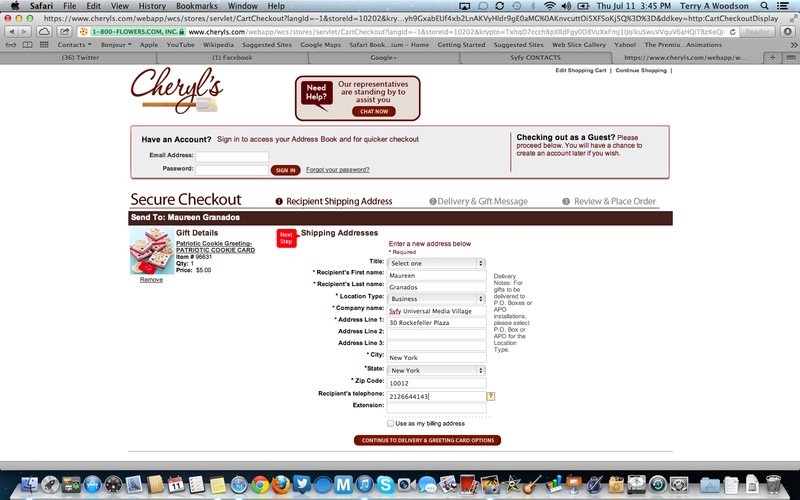 Here is that screen, all you have to do is click the “Keep Existing Address Info” button and continue on. That’s it! 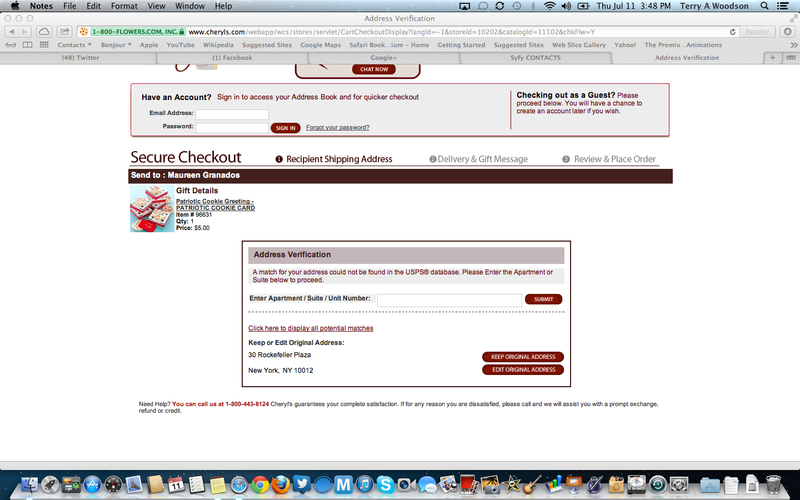 Now, be aware on the next page you will enter your info and complete the purchase. Somewhere between the previous screen and the next one you will get a popup asking you if you want to add any other products. That is strictly your choice – I just want you to know that at the bottom of this window is a “No Thanks, Keep Going” button to the left of the “Yes, Add to my order” button. The “Add” button is in red, the “No Thanks” is kind of greyed out – it’s more visual advertising, and that’s OK. If you choose the “No Thanks” like I did, you will only pay the $5.44 total. I think that is more than fair to let the people at NBC/Universal Media Village know our goals. And in the past, I have been part of “Mail it in” campaigns where we sent, for example, bottles of Tabasco sauce to the executives at the CW to try and get Roswell renewed. This is a whole lot less messy – and basically the product (a $11.98!) value is free – we’re really just paying the $5.44 to ship it! What could be better than that? So, friends, I urge you – spread the word! Tell everyone they can come here and read this post, and hopefully we can shout loud enough that we’ll get somebody’s attention! You can leave me a message in the comment, or tweet them to me @Teknokai at Twitter, or look me up on Facebook – I’m TeknoKai there too! Come on, friends! Let’s do this!!! *Author’s Note: Sorry to the first few readers of this post. In my haste to get the word out it kept a few grammatical errors. I have corrected them now. Thanks for reading, and thanks even more for participating! ← A Little Analogy of Life and Work … Both Things are Deeply Connected! RenewWarehouse13.com, which might be the only reason we’re getting a final season at all, has a lot of information you might want to read over before you continue a campaign to send cookies to someone with absolutely no decision-making power over a show that is currently filming the 2nd of its last 6 episodes and whose writers have already vacated their offices. Yeahhh…the RenewWarehouse13 campaign is already done. The show is done, once they finish filming. You, like so many others, are late to the party. It’s great that you want to help one of the greatest shows out there but it’s too late. They’ve started filming on the LAST season. This is pointless, and a waste of money. You’re asking people to spend money to send cookies to someone who has absolutely no say in any show getting renewed. I implore you, stop asking people to do this. If you actually fully looked over the RenewWarehouse13 website you would understand why this type of campaigning 9/10 does absolutely nothing. Seriously, stop. The writers are done, the filming is underway, the show is FINISHED. Syfy almost definitely purposely killed off this show. They don’t want it. This is so pointless and so much of a waste of time. Don’t send free cookies to people who have no control over anything. Accept that Warehouse 13 is ending, like the rest of us, and move on with your life. This is embarrassing, to be frank. There are posts on Tumblr and elsewhere laughing their a**es off at you. You will accomplish nothing, except people wasting their money and time, I guarantee it. Thank you for your opinion, Donovan. I’m sorry, I just don’t agree with you. If people out there are laughing at me, then maybe I have made their lives more tolerable for just a bit more. I still don’t think that Big Advertising has more of a voice than the common man. If I am never heard, then it was not meant to be. But I have a voice, and by God, I’m going to use it. I would be stupid to think everyone on the planet would agree, and really idiotic to assume that everyone liked the same thing I did, or even wanted to “stir the waters”. But I imagine people told Ben Franklin he was an idiot too, and that he should get out of the rain. Had he done that, we wouldn’t be enjoying the wonderful electricity we have now that we take for granted. So, sir, I appreciate your opinion. I’m glad if people get a laugh out of me. They’re aren’t hurting me in the least, and laughter prolongs life. So I will stand by my idea, because it is my idea, and I know it isn’t perfect. But it isn’t a waste either, because somebody is going to enjoy a Heckuva lot of delicious cookies! May you find Harmony, and may your days be filled with peace and happiness. One more thing I’d like to say, then I continue to welcome all comments, from all perspectives, and opinion bases. I have lived in the heart of the Bible Belt, in Mississippi my whole life, as a gay man. 2 years ago, I stopped hiding from myself and embraced who I am. I have been told all my life that my ideas are ridiculous, and that they aren’t worthy of attention because I am a freak. Well, I just want you to know that I’m proud to be a freak. More and more people are beginning to realize that people like me are out here. And you know what? I don’t expect anyone to think I’m any smarter than anyone else. But I am me, and my opinion counts. So if you want to help me “make” some noise, please do. If you don’t, then don’t. It’s totally up to you. But if people like hadn’t taken a stand, and many of us have been ridiculed, tortured, and killed, then we wouldn’t be on the verge of letting the world know that gay people count – someone had to raise their voice to start the gay pride movement. And yes, I went there, because all fans know that one of the central characters (not the actor playing him, necessarily) is gay – and he gives us one helluva role model to see what LGBT people can do. And that is one more reaso I just don’t want to give up on Warehouse 13. So if you have “accepted that it is over, and move[d] on with your life, great for you. I’m not ready to give up yet. And this is how I make my stand. May you all find Harmony. I’m not really wonderful with English but I find this really easy to understand.